It’s likely that a number of you will be more familiar with the BioBlitz. As defined by the Bristol Natural History Consortium, a BioBlitz (or bioblitz) is an intense period of biological surveying in an attempt to record all the living species within a designated area. Groups of scientists, naturalists and volunteers conduct an intensive field study over a continuous time period (e.g. usually 24 hours). The concept was first coined in the US in the late 1990’s and has gone on to be a very popular way to bring together members of the public together with experts in order to gain something of use to conservation. On one such BioBlitz I can recall being in the back of a van for the best part of the 24 hours identifying pondlife! Last year on 14th September, in partnership with Wild Oxfordshire, the Freshwater Habitats Trust, and Thames Water, amongst others, we launched what was probably the first ‘WaterBlitz’ across the River Thames catchment. As per a conventional BioBlitz, the intention was to collect as many nitrate and phosphate measurements within a 24 hour period with the help of citizen scientists. In all, 645 measurements were sampled by individual members of the public, school and community groups and experts alike! In keeping with citizen science this was far more than any single scientist or team of scientists could collect in a day. Find out more about the data through the FreshWater Watch Water Hub. The benefit of collecting this amount of data within a 24 hour period is that you get a temporally comparable result whether you are on a small tributary of the Lea or on the Thames at Lechlade. At the same time, water quality differences between sites are less likely to represent seasonal or climatic changes that occur throughout the year. Importantly, they are more likely to highlight underlying issues such as pollution sources. Aside from contributing to the wider FreshWater Watch initiative, data collected in this manner directly compliments regular monitoring carried out by Centre for Ecology and Hydrology and could help elucidate particularly problematic still and flowing waters. This year will see two such WaterBlitzs’ on the Thames on 25th April and 3rd October. The addition of repeat samples will be able to tell us if those areas with high levels of nutrients last year continue in the same manner. 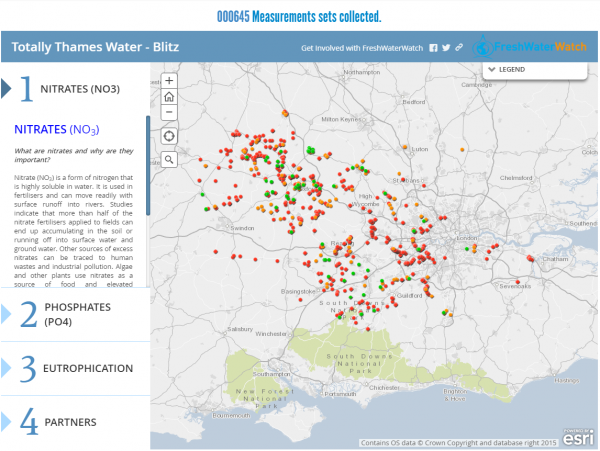 If you are interested in taking part in this novel and ground-breaking aspect of citizen science for water quality see here and watch out for more popping up across the UK! Dr. Ian -- thank you for all of your work and support! It's fantastic to learn from experts like yourself and how individuals can make a difference. We don't all have to be quaified to wear a lab coat, but experie like yours is invaluable to help us "lay people" understand. Hi Ray and thank you! We similarly hugely appreciate anyone who engages with their environment, whether through FreshWater Watch or not.